Anticoagulation in conjunction with antiplatelet therapy is central to the management of acute coronary syndromes (ACS). When used effectively it is associated with a reduction in recurrent ischaemic events including myocardial infarction and stent thrombosis as well as a reduction in death. Effective ischaemic risk reduction whilst balancing bleeding risk remains a clinical challenge. This article reviews the current available evidence for anticoagulation in ACS and recommendations from the European Society of Cardiology. 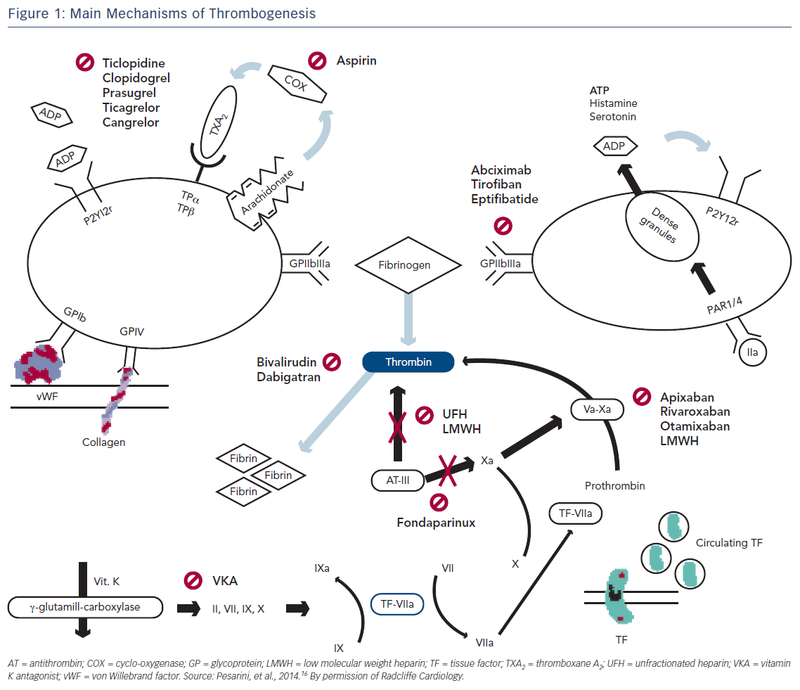 Therapies that modify thrombogenesis form the foundation for the management of ACS and prevention of recurrent ischaemic events. The net clinical benefit of antithrombotic therapies must be weighed against the inevitable increased risk of bleeding. Vascular damage triggers a cascade of pathways designed to maintain the integrity of the coronary circulation and to achieve haemostasis. Under normal conditions, controlled regulation of these pathways achieves the right balance between adequate coronary flow and appropriate vessel repair. Disruption of this homeostasis in the coronary circulation may result in life-threatening thrombosis. Early mechanical and chemical reperfusion with percutaneous coronary intervention (PCI) and the use of antithrombotic agents respectively form the basis of ACS treatment and have been proven to reduce the frequency of both early and late cardiovascular events.7–13 Increased use of PCI further necessitates adequate antithrombotic therapy to reduce the risk of device-related complications. Activation of coagulation pathways is crucial for thrombus formation. Fibroblasts and smooth muscle cells express the membrane protein tissue factor, which is also present in blood. At sites of vascular damage, platelets express disulphide isomerase, which cleaves tissue factor into its active form. Activated tissue factor can then bind factor VIIa and the resulting complex activates factors VII, IX and X. Factors Xa and V complex together promoting thrombin generation. The narrow therapeutic window of UFH and its significant pharmacokinetic variability between patients requires administration to be closely monitored. Its anticoagulant effect can be monitored using either the activated clotting time (ACT) in the cardiac catheterisation laboratory or the activated partial thromboplastin time (aPTT) in other areas. Intravenous UFH dosing is weight dependent, with current ESC guidelines recommending an initial bolus of 60–70 IU/kg up to a maximum of 5000 IU, followed by an infusion of 12–15 IU/kg/h up to a maximum of 1000 IU/h.4 During PCI, ACT-guided IV UFH boluses can be used, aiming for a range of 200–250 seconds if a glycoprotein IIb/IIIa (GPIIb/IIIa) inhibitor is given and 250–350 seconds in all other cases. Alternatively, weight-adjusted UFH at 50–70 IU/kg in combination with a GPIIb/IIIa inhibitor or 70–100 IU/kg (in the absence of GPIIb/IIIa) can be administered.4 If there are no other indications for UFH, it should be stopped following revascularisation. The ESC recommends use of additional parenteral anticoagulation both before and after fibrinolysis in ST-elevation ACS (STE-ACS) with anticoagulation, and this should be used until planned definitive revascularisation is performed.23 Medically managed patients should be anticoagulated for at least 48 hours. The use of UFH in patients with primary PCI (PPCI) has not been evaluated in placebo-controlled trials. It is, however, routinely recommended in patients not receiving bivalirudin or enoxaparin. An initial bolus of 70–100 U/kg is recommended when no GP IIb/IIIa inhibitor is planned. A dose of 50–60 U/kg should be administered when the use of GP IIb/IIIa inhibitors is expected.23 There is no clear evidence supporting ACT monitoring of UFH in the context of PPCI and doing so should not delay revascularisation. Fondaparinux is a selective Xa inhibitor with a half-life of 17 hours administered subcutaneously and once daily in patients with NST-ACS. It prevents the formation of thrombin by reversibly binding to antithrombin. Similarly to enoxaparin, fondaparinux rarely binds plasma proteins resulting in a more predictable anticoagulant effect, and no monitoring is required as it is fully bioavailable. Although there is no risk of HIT, fondaparinux is renally excreted and is not recommended if estimated GFR is <20 ml/min/1.73 m2. In the Arixtra Study in Percutaneous Coronary Intervention: a Randomized Evaluation (ASPIRE) trial, 350 patients undergoing PCI were randomised to receive either fondaparinux (2.5 mg or 5 mg) or UFH.45 There was no significant difference in rates of bleeding between the two groups (6.4 % versus 7.7 %; p=0.61), but significantly fewer bleeding events were noted when the lower dose (2.5 mg) of fondaparinux was used. An analysis of 20,078 patients demonstrated non-inferiority of fondaparinux compared with enoxaparin with respect to ischaemic events in NSTE-ACS in the fifth Organization to Assess Strategies in Acute Ischaemic Syndromes (OASIS-5) study.46 The use of fondaparinux in this trial resulted in a substantial reduction in 30-day and 6-month mortality rates. In-hospital major bleeding rate was approximately half of that of the enoxaparin arm. The rate of major bleeding events at 9 days in patients who had PCI was significantly lower in those treated with fondaparinux compared with enoxaparin.47. This was independent of the timing of the intervention in relation to the last dose of anticoagulation administered. Catheter-related thrombosis occurred more frequently in patients pre-treated with fondaparinux leading to a recommendation to give a bolus of UFH at the time of PCI. Bivalirudin is a synthetic congener of naturally occurring hirudine, with a high affinity for thrombin in its clot-adherent and circulating form, thereby preventing the conversion of fibrinogen to fibrin. The bivalirudin–thrombin bonds can be gradually cleaved by thrombin itself making bivalirudin’s actions reversible. It has a short half-life of 25 minutes. Bivalirudin’s anticoagulant effect is predictable as it does not bind plasma proteins and monitoring can be done using APTT or ACT measurements. No association between bivalirudin and HIT has been found. Outcomes for bivalirudin (0.75 mg/kg followed by 1.75 mg/kg/h during the intervention) plus GPIIb/IIIa was compared with UFH plus GPIIb/IIIa inhibitor in patients undergoing elective or urgent PCI in the Randomized Evaluation in PCI Linking Angiomax to Reduced Clinical Events 2 (REPLACE-2) trial.52 Although there were no differences in the overall primary composite endpoint of death, MI, urgent repeat revascularisation and in-hospital major bleeding at 30 days, analysis of the individual components revealed a significant reduction in the rates of in-hospital major and minor bleeding in the bivalirudin arm. A direct comparison of bivalirudin versus UFH in stable coronary artery disease was carried out in the ISAR-REACT 3 study.58 In 4,750 patients undergoing PCI for biomarker-negative NSTE-ACS, rates of death, MI and revascularisation at 30 days were similar between the two groups. A significant reduction in the rate of bleeding events was noted in the bivalirudin arm. Bivalirudin use following streptokinase has been demonstrated to significantly reduce rates of recurrent MI, but had no impact on mortality rates compared with UFH.59 An increase in bleeding rates was noted in the bivalirudin arm, but this was not significant. In the Minimizing Adverse Hemorrhagic Events by Transradial Access Site and Systemic Implementation of Angiox (MATRIX) trial, 7,213 patients presenting with an ACS and planned for PCI were randomly assigned to receive either a bivalirudin infusion post PCI or UFH.60 Major adverse cardiac event and net adverse clinical events rates were not significantly different between the groups. In the How Effective are Antithrombotic Therapies in Primary Percutaneous Coronary Intervention (HEAT-PPCI) trial, 1,812 patients presenting with STE-ACS either received bivalirudin of heparin following randomisation.61 Rates of major adverse ischaemic events in the setting of PPCI were significantly lower in the heparin group without an increase in bleeding rates. In the Harmonizing Outcomes with Revascularization and Stents in Acute Myocardial Infarction (HORIZONS-AMI) trial, 3,602 patients presenting within 12 hours of STE-ACS onset were randomised to receive either UFH plus GPIIb/IIIa inhibitor or bivalirudin.62 Rates of major bleeding, death and all-cause death were significantly reduced in patients receiving bivalirudin. An increase in rates of acute stent thrombosis was noted in the bivalirudin group, but this effect disappeared by 30 days. ESC guidelines for STEMI recommend bivalirudin with bailout GPIIb/IIIa inhibitors over UFH plus GPIIb/IIIa inhibitors.23 An antithrombin agent should be given to patients presenting within 12 hours of symptom onset that have not been given reperfusion therapy. Newer anticoagulants in the setting of ACS mostly target secondary prevention rather than the initial phase of the disease. These include anti-Xa therapies (apixaban, rivaroxaban, otamixaban) and the direct thrombin inhibitor dabigatran. Significantly lower rates of cardiovascular death were seen in patients with ACS established on aspirin and clopidogrel who were given low-dose rivaroxaban over placebo in the Anti-Xa Therapy to Lower Cardiovascular Events in Addition to Standard Therapy in Subjects with Acute Coronary Syndrome–Thrombolysis in Myocardial Infarction 51 (ATLAS ACS 2-TIMI 51) study.64 This has led to the recommendation that the use of rivaroxaban 2.5 mg twice daily might be considered in combination with aspirin and clopidogrel if ticagrelor and prasugrel are not available for patients with NSTEMI who have high ischaemic and low bleeding risks. Dabigatran was investigated in a Phase II dose-finding trial (Randomized Dabigatran Etexilate Dose Finding Study In Patients with Acute Coronary Syndromes Post Index Event With Additional Risk Factors For Cardiovascular Complications Also Receiving Aspirin And Clopidogrel [RE-DEEM]).65 Dabigatran, in addition to dual antiplatelet therapy, was associated with a dose-dependent increase in bleeding events and significantly reduced coagulation activity in patients with a recent MI. A Phase III trial of the intravenous anti-Xa drug otamixaban did not reduce ischaemic event rates, but significantly increased bleeding rates when compared with UFH plus eptifibatide.66 These findings did not support the use of otamixaban for patients with NSTE-ACS undergoing planned early PCI. The use of anticoagulant therapy is an essential adjunct to antiplatelet therapy in the acute treatment of ACS, and is limited to treatment during initial hospitalisation and revascularisation. Large, randomised clinical trials have shown the benefit of fondaparinux as a safer (with similar efficacy) alternative to either LMWH or UFH and it is the anticoagulant of choice on admission. Once a decision is made for invasive management then either UFH or LMWH must be given during catheterisation to prevent formation of thrombus during the procedure. The role of bivalirudin in ACS has been controversial. It is an effective, but expensive drug with a short half-life; however, recent data showing an increase in acute stent thrombosis have largely negated the reduction seen in major bleeding rates. A patient-centred approach is required to balance ischaemic and bleeding risk and it would appear that this can be successfully achieved with a choice of antiplatelet agents of differing potency and anticoagulants limited to fondaparinux and low dose heparins. At the time of writing, the newer direct anti-Xa and direct thrombin inhibitors lack the data to recommend routine use in ACS patients but may have a role in ACS patients presenting with persistent atrial fibrillation. Jernberg T, Hasvold P, Henriksson M, et al. Cardiovascular risk in post-myocardial infarction patients: nationwide real world data demonstrate the importance of a long-term perspective. Eur Heart J 2015;36:1163–70. Fuster V, Badimon L, Badimon JJ, Chesebro JH. The pathogenesis of coronary artery disease and the acute coronary syndromes (2). N Engl J Med 1992;326:310–8. De Caterina R, Goto S. Targeting thrombin long-term after an acute coronary syndrome: opportunities and challenges. Vasc Pharmacol 2016 81:1–14. Roffi M, Patrono C, Collet JP, Mueller C, et al. 2015 ESC Guidelines for the management of acute coronary syndromes in patients presenting without persistent ST-segment elevation: Task Force for the Management of Acute Coronary Syndromes in Patients Presenting without Persistent ST-Segment Elevation of the European Society of Cardiology (ESC). Eur Heart J 2016;37:267–315. Arbustini E, Dal Bello P, Morbini P, et al. Plaque erosion is a major substrate for coronary thrombosis in acute myocardial infarction. Heart 1999;82:269–72. Davies MJ. The pathophysiology of acute coronary syndromes. Heart 2000;83:361–6. Lewis HD, Davis JW, Archibald DG, et al. Protective effects of aspirin against acute myocardial infarction and death in men with unstable angina. N Engl J Med 1983;309:396–403. Théroux P, Ouimet H, McCans J, et al. Aspirin, heparin or both to treat unstable angina. N Engl J Med 1988;319:1105–11. Cohen M, Demers C, Gurfinkel EP, et al. Efficacy and Safety of Subcutaneous Enoxaparin in Non-Q-Wave Coronary Events Study Group. A comparison of low-molecular-weight heparin with unfractionated heparin for unstable coronary artery disease. N Engl J Med 1997;337:447–52. Yusuf S, Zhao F, Mehta SR, et al. Effects of clopidogrel in addition to aspirin in patients with acute coronary syndromes without ST-segment elevation. N Engl J Med 2001;345:494–502. Platelet Receptor Inhibition for Ischemic Syndrome Management in Patients Limited by Unstable Signs and Symptoms (PRISM-PLUS) Trial Investigators. Inhibition of the platelet glycoprotein IIb/IIIa receptor with tirofiban in unstable angina and non-Q-wave myocardial infarction. N Engl J Med 1998;338:1488–97. Cannon CP, Weintraub WS, Demopoulos LA, et al. Comparison of early invasive and conservative strategies in patients with unstable coronary syndromes treated with the glycoprotein IIb/IIIa inhibitor tirofiban. N Engl J Med 2001;344:1879–87. Cannon CP, Braunwald E. Time to reperfusion: the critical modulator in thrombolysis and primary angioplasty. J Thromb Thrombolysis 1996;3:117–25. Ndrepepa G, Berger PB, Mehilli J, et al. Periprocedural bleeding and 1-year outcome after percutaneous coronary interventions: appropriateness of including bleeding as a component of a quadruple end point. J Am Coll Cardiol 2008;51:690–7. Gailani D, Renne T. Intrinsic pathway of coagulation and arterial thrombosis. Arterioscler Thromb Vasc Biol 2007;27:2507–13. Pesarini, Ariotti, Ribichini F. Current antithrombotic therapy in patients with acute coronary syndromes undergoing percutaneous coronary interventions. Interv Cardiol 2014;9:94–101. Eikelboom JW, Anand SS, Malmberg K et al. Unfractionated heparin and low-molecular-weight heparin in acute coronary syndrome without ST elevation: a meta-analysis. Lancet 2000;355:1936–42. Genereux P, Palmerini T, Caixeta A, et al. Quantification and impact of untreated coronary artery disease after percutaneous coronary intervention: the residual SYNTAX (Synergy Between PCI with Taxus and Cardiac Surgery) score. J Am Coll Cardiol 2012;59:2165–74. Cohen M, Adams PC, Parry, et al. Combination antithrombotic therapy in unstable rest angina and non-Q-wave infarction in nonprior aspirin users. Primary end points analysis from the ATACS trial. Antithrombotic Therapy in Acute Coronary Syndromes Research Group. Circulation 1994;89:81–8. RISC Group. Risk of myocardial infarction and death during treatment with low dose aspirin and intravenous heparin in men with unstable coronary artery disease. Lancet 1990;336:827–30. Théroux P, Waters D, Qiu S, et al. Aspirin versus heparin to prevent myocardial infarction during the acute phase of unstable angina. Circulation 1993;88(5 pt 1):2045–8. Steg PG, Mehta S, Xavier D et al. Fondaparinux with UnfracTionated heparin dUring Revascularization in Acute coronary syndromes (FUTURA/OASIS 8): a randomized trial of intravenous unfractionated heparin during percutaneous coronary intervention in patients with non-ST-segment elevation acute coronary syndromes initially treated with fondaparinux. Am Heart J 2010;160:1029–34, 1034.e1. The Task Force on the management of ST-segment elevation acute myocardial infarction of the European Society of Cardiology (ESC), Steg PG, James SK, Atar D, et al. ESC Guidelines for the management of acute myocardial infarction in patients presenting with ST-segment elevation. Eur Heart J 2012;33:2569–619. Silvain J, Beygui F, Barthelemy O, et al. Efficacy and safety of enoxaparin versus unfractionated heparin during percutaneous coronary intervention: systematic review and meta-analysis. BMJ 2012;344:e553. Weitz JI. Low-molecular-weight heparins. N Engl J Med 1997;337:688–98. Garcia DA, Baglin TP, Weitz J, Samama MM. Parenteral anticoagulants: Antithrombotic Therapy and Prevention of Thrombosis, 9th ed: American College of Chest Physicians Evidence-Based Clinical Practice Guidelines. Chest 2012;141(2 Suppl):e24S–43S. Warkentin TE, Levine MN, Hirsh J, et al. Heparin-induced thrombocytopenia in patients treated with low-molecular-weight heparin or unfractionated heparin. N Engl J Med 1995;332:1330–5. de Lemos JA, Blazing MA, Wiviott SD, et al. Enoxaparin versus unfractionated heparin in patients treated with tirofiban, aspirin and an early conservative initial management strategy: results from the A phase of the A-to-Z trial. Eur Heart J 2004;25:1688–94. Ferguson JJ, Califf RM, Antman EM, et al. Enoxaparin vs unfractionated heparin in high-risk patients with non-ST- segment elevation acute coronary syndromes managed with an intended early invasive strategy: primary results of the SYNERGY randomized trial. JAMA 2004;292:45–54. Montalescot G, Zeymur U, Silvain J et al. Intravenous enoxaparin or unfractionated heparin in primary percutaneous coronary intervention for ST-elevation myocardial infarction: the international randomised open-label ATOLL trial. Lancet 2011;378:693–703. Murphy SA, Gibson CM, Morrow DA, et al. Efficacy and safety of the low-molecular weight heparin enoxaparin compared with unfractionated heparin across the acute coronary syndrome spectrum: a meta-analysis. Eur Heart J 2007;28:2077–86. Assessment of the Safety and Efficacy of a New Thrombolytic Regimen (ASSENT)-3 Investigators. Efficacy and safety of tenecteplase in combination with enoxaparin, abciximab, or unfractionated heparin: the ASSENT-3 randomised trial in acute myocardial infarction. Lancet 2001;358:605–3. Wallentin L, Goldstein P, Armstrong PW et al. Efficacy and safety of tenecteplase in combination with the low-molecular-weight heparin enoxaparin or unfractionated heparin in the pre-hospital setting: the Assessment of the Safety and Efficacy of a New Thrombolytic Regimen (ASSENT)-3 PLUS randomized trial in acute myocardial infarction. Circulation 2003;108:135–42. Giraldez RR, Nicolau JC, Corbalan R, et al. Enoxaparin is superior to unfractionated heparin in patients with ST elevation myocardial infarction undergoing fibrinolysis regardless of the choice of lytic: an ExTRACT-TIMI 25 analysis. Eur Heart J 2007;28:1566–73. White HD, Braunwald E, Murphy SA, et al. Enoxaparin vs. unfractionated heparin with fibrinolysis for ST-elevation myocardial infarction in elderly and younger patients: results from ExTRACT-TIMI 25. Eur Heart J 2007;28:1066–71. Montalescot G, Ellis SG, de Belder MA, et al. Enoxaparin in primary and facilitated percutaneous coronary intervention A formal prospective nonrandomized substudy of the FINESSE trial (Facilitated INtervention with Enhanced Reperfusion Speed to Stop Events). JACC Cardiovasc Interv 2010;3:203–12. Navarese EP, De Luca G, Castriota F, et al. Low-molecular-weight heparins vs. unfractionated heparin in the setting of percutaneous coronary intervention for ST-elevation myocardial infarction: a meta-analysis. J Thromb Haemost 2011;9:1902–15. Collet JP, Montalescot G, Lison L, et al. Percutaneous coronary intervention after subcutaneous enoxaparin pretreatment in patients with unstable angina pectoris. Circulation 2001;103:658–63. Martin JL, Fry ET, Sanderink GJ, et al. Reliable anticoagulation with enoxaparin in patients undergoing percutaneous coronary intervention: the pharmacokinetics of enoxaparin in PCI (PEPCI) study. Catheter Cardiovasc Interv 2004;61:163–70. Ferguson JJ, Califf RM, Antman EM, et al. Enoxaparin vs unfractionated heparin in high-risk patients with non-ST-segment elevation acute coronary syndromes managed with an intended early invasive strategy: primary results of the SYNERGY randomized trial. JAMA 2004;292:45–54. Wiviott SD, Braunwald E, McCabe CH, et al. Prasugrel versus clopidogrel in patients with acute coronary syndromes. N Engl J Med 2007;357:2001–15. Wallentin L, Becker RC, Budaj A, et al. Ticagrelor versus clopidogrel in patients with acute coronary syndromes. N Engl J Med 2009;361:1045–57. Montalescot G, Wiviott SD, Braunwald E, et al. Prasugrel compared with clopidogrel in patients undergoing percutaneous coronary intervention for ST-elevation myocardial infarction (TRITONTIMI 38): double-blind, randomised controlled trial. Lancet 2009;373:723–31. Simoons ML, Bobbink IW, Boland J, et al. A dose-finding study of fondaparinux in patients with non-ST-segment elevation acute coronary syndromes: the Pentasaccharide in Unstable Angina (PENTUA) Study. J Am Coll Cardiol 2004;43:2183–90. Mehta SR, Steg PG, Granger CB, et al. Randomized, blinded trial comparing fondaparinux with unfractionated heparin in patients undergoing contemporary percutaneous coronary intervention: Arixtra Study in Percutaneous Coronary Intervention: a Randomized Evaluation (ASPIRE) Pilot Trial. Circulation 2005; 22;111:1390–7. Fifth Organization to Assess Strategies in Acute Ischemic Syndromes Investigators, Yusuf S, Mehta SR, Chrolavicius S, et al. Comparison of fondaparinux and enoxaparin in acute coronary syndromes. N Engl J Med 2006;354:1464–76. Jolly SS, Faxon DP, Fox KA, et al. Efficacy and safety of fondaparinux versus enoxaparin in patients with acute coronary syndromes treated with glycoprotein IIb/IIIa inhibitors or thienopyridines: results from the OASIS 5 (Fifth Organization to Assess Strategies in Ischemic Syndromes) trial. J Am Coll Cardiol 2009;54:468–76. Szummer K, Oldgren J, Lindhagen L, et al. Association between the use of fondaparinux vs low-molecular-weight heparin and clinical outcomes in patients with non-ST-segment elevation myocardial infarction. JAMA 2015;313:707–16. Yusuf S, Mehta SR, Chrolavicius S, et al. Effects of fondaparinux on mortality and reinfarction in patients with acute ST-segment elevation myocardial infarction: the OASIS-6 randomized trial. JAMA 2006;295:1519–30. Peters RJ, Joyner C, Bassand JP, et al. The role of fondaparinux as an adjunct to thrombolytic therapy in acute myocardial infarction: a subgroup analysis of the OASIS-6 trial. Eur Heart J 2008;29:324–31. Lee KL, Woodlief LH, Topol EJ, et al. Predictors of 30-day mortality in the era of reperfusion for acute myocardial infarction. Results from an international trial of 41,021 patients. GUSTO-I Investigators. Circulation 1995;91:1659–68. Lincoff AM, Bittl JA, Harrington RA, et al. REPLACE-2 Investigators. Bivalirudin and provisional glycoprotein IIb/IIIa blockade compared with heparin and planned glycoprotein IIb/IIIa blockade during percutaneous coronary intervention: REPLACE-2 randomized trial. JAMA 2003;289:853–63. Stone GW, McLaurin BT, Cox DA, et al. Bivalirudin for patients with acute coronary syndromes. N Engl J Med 2006;355:2203–16. Stone GW, White HD, Ohman EM, et al. Bivalirudin in patients with acute coronary syndromes undergoing percutaneous coronary intervention: a subgroup analysis from the Acute Catheterization and Urgent Intervention Triage strategY (ACUITY) trial. Lancet 2007;369:907–19. Stone GW, Ware JH, Bertrand ME, et al. Antithrombotic strategies in patients with acute coronary syndromes undergoing early invasive management: one-year results from the ACUITY trial. JAMA 2007;298:2497–506. White HD, Chew DP, Hoekstra JW, et al. Safety and efficacy of switching from either unfractionated heparin or enoxaparin to bivalirudin in patients with non-ST-segment elevation acute coronary syndromes managed with an invasive strategy: results from the ACUITY (Acute Catheterization and Urgent Intervention Triage strategY) trial. J Am Coll Cardiol 2008;51:1734–41. Kastrati A, Neumann FJ, Schulz S, et al. Abciximab and heparin versus bivalirudin for non-ST-elevation myocardial infarction. N Engl J Med 2011;365:1980–9. Kastrati A, Neumann FJ, Mehilli J, et al. Bivalirudin versus unfractionated heparin during percutaneous coronary intervention. N Engl J Med 2008;359:688–96. White H. Thrombin-specific anticoagulation with bivalirudin versus heparin in patients receiving fibrinolytic therapy for acute myocardial infarction: the HERO-2 randomised trial. Lancet 2001;358:1855–63. Valgimigli M, Frigoli E, Leonardi S, et al. Bivalirudin or unfractionated heparin in acute coronary syndromes. N Engl J Med 2015;373:997–1009. Shahzad A, Kemp E, Mars C, et al. Unfractionated heparin versus bivalirudin in primary percutaneous coronary intervention (HEAT-PPCI): an open-label, single centre, randomised controlled trial. Lancet 2014;384:1849–58. Stone G, Clayton T, Deliargyris E, et al. Reduction in cardiac mortality with bivalirudin in patients with and without major bleeding: The HORIZONS-AMI Trial (Harmonizing Outcomes with Revascularization and Stents in Acute Myocardial Infarction). J Am Coll Cardiol 2014;63:15–20. Alexander JH, Lopes RD, James S, et al. Apixaban with antiplatelet therapy after acute coronary syndrome. N Engl J Med 2011;365:699–708. Mega JL, Braunwald E, Wiviott SD, et al. Rivaroxaban in patients with a recent acute coronary syndrome. N Engl J Med 2012;366:9–19. Oldgren J, Budaj A, Granger CB, et al. Dabigatran vs. placebo in patients with acute coronary syndromes on dual antiplatelet therapy: a randomized, double-blind, phase II trial. Eur Heart J 2011;32:2781–9. Steg PG, Mehta SR, Pollack CV Jr, et al. Anticoagulation with otamixaban and ischemic events in non-ST-segment elevation acute coronary syndromes: the TAO randomized clinical trial. JAMA 2013;310:1145–55.